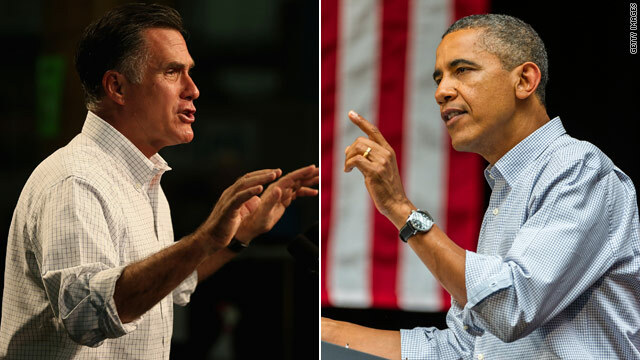 (CNN) - A new national poll released on the eve of the first presidential debate shows that the race between President Barack Obama and Republican presidential nominee Mitt Romney remains close. The overall head-to-head result among likely voters surveyed for the NBC News/Wall Street Journal poll matches the latest CNN Poll of Polls, which is an average of this new poll and six other recent surveys conducted in the past week. The NBC/WSJ survey found that 49% of likely voters support Obama while 46% back Romney. The three-point margin is within the sampling error of plus or minus 3.4 percentage points. The CNN Poll of Polls also found a three-point difference, advantage Obama, although as an average of multiple polls, it does not have a calculable sampling error. Three points was the same margin in a CNN/ORC International poll released earlier this week, also showing the slight advantage going to Obama and also within the sampling error. Democratic pollster Peter D. Hart - who conducted the Tuesday sample with a Republican pollster - said the numbers show Obama "has the better hand." The two candidates will go head-to-head Wednesday in the first presidential debate in Denver, Colorado. Only 22% of registered voters in the NBC/WSJ polll said this season's debates figure into their selection process as "extremely important," while the largest number - 34% - said the debates will be "somewhat important" to their November decision. Asked about the country's direction, 53% said the nation is on the wrong track while 40% said it is on the right track, showing only slight movement from an NBC/WSJ poll conducted last month. Approval ratings for Obama as well as opinions on how the president is handling the economy are also nearly unchanged from the mid-September sample. The economy, which the moderator of Wednesday's debate has said will be the focus of about half the debate, is the primary issue to a plurality of voters: 46% considered it the most important issue. Social issues and values followed with 15%, while Social Security, health care, deficit, foreign policy and other topics lagged behind. The NBC/WSJ poll found 45% of registered voters feel more negative toward Romney in reaction to clips posted online showing him talking about the "47%" of Americans who pay no federal income tax and are dependent on government. The GOP candidate was secretly recorded at a May fund-raiser saying that portion of the population could not be persuaded to vote for him because his message of low taxes would not resonate with them. Nearly equal numbers - 23% and 24% - said the comments increased or made little difference in their impression of Romney, according to the survey. The publicly available survey data did not show how those numbers related to the partisan breakdown of the sample - such as whether the voters who said they were less likely to support Romney were Democrats not initially inclined toward the Republican candidate. A separate Pew Research Center survey released Monday found 55% of voters had a negative reaction and 23% had a positive reaction to the video. Among Republicans, 54% had a positive reaction, 17% a negative reaction, and 29% were neutral. Among Democrats, only 5% reacted positively while 88% reacted negatively and 7% were neutral. Independents split 18% positive and 55% negative, with 27% undecided. The Pew survey was conducted from September 27 to 30 and included 828 registered voters with a sampling error of plus or minus 4.1 percentage points. The sampling error is higher among the subgroups. The NBC News/Wall Street Journal poll included 832 likely voters reached by telephone between September 26 and 30. Independents will be capable of making decisions without sound-bites from Fox News. They will understand the impact of Republican obstructionism in harming our economic recovery. They will know Romney is just another copy of George W. Bush – except Romney is even more of a "chicken-hawk". Romney will try to kill Medicare and Social Security. Romney only cares about his buddies – the ultra-rich. He considers working Americans pawns to believe the lies, do the work and fight the wars. Independents are not like the under-educated, bigoted, and radical Republican base. They have brains! Ann Romney tells CNN her husband's debate routine includes paying homage every time to a very important person in his life, his father, the former Michigan governor, George Romney. This election is not about Mitt Romney's Father. From day one it has been as if Mitt has more to prove to his father then to the American people. I understand the feelings and pride one has towards ones father , however father issues should not influence ones judgment or decision making. What is close,what republicans wish it were or the actual polls saying all are with or leaning Pres.Obama except possibly Colorado,just what is it..Iowans ballots 3x more Democrates than republicans,pretty much the same percentage returned in absentee ones from early voting..Democrates happily voting ,republicans grumbling about what's going on ,why the poor republican turn out and where it went wrong.Republicans hoping this isn't the start of a long election,remember McCains November,it wasn't as he would want it but he again is your guy,but he had Palin didn't he,that pig did wear lipstick didn't she!I'm glad Romneys thinking ,he thinks he'll outspend another challenger again but he's up against a smart one who doesn't need the money he does,he's got people power something Romney never counted on..He's already set up surrogates for the debates,exmayors and such who worked with but didn't like Romney as Massachusetts governor,they'll dispute his lies and tell voters nationwide what Romneys really about,the gigs up buddy time to go check out the two story elevator,see yah!! I don't care what Mittens says, I'm voting for President Obama! this is BIZZARE – does the media believe that American voters chnage their minds like they change their underwear! one minuet one is up / then its neck and neck / then its a horse race / then its a runaway / what the hell is it ? The media not does'nt know so just forget it – jumping jack poll reporting only shows how desperate the media is fo something to report and that includes CNN – try some fact based / thoughtful / insigtfull / unbiased reportiing and editiriolizing and less of this crap reporting whith twisted facts – is the media afraid to take a stand or what -get on board with reality or get the hell out of the business of "reporting" – the facts are Obama is winning / will win / and Rommney / ??? haven't a clue – just say so! Because that is fact!! Excuse me? Unchanged Obama approval numbers. What are those numbers? What about the Obama redistribution of wealth video? Will that ever be discussed? I will be so glad when November is over and we won't have 500 polls with 499 different answers. Pack your bags BARRY, it's back to being a political hack in CHICAGO......LOSER. Romney 26 % Obama 72%. Wow, that's close! So does this mean we'll be seeing more of those "Electoral College Tie" segments you've been using for the last decade? I know that for many viewers, seeing John King elaborate on a very specific set of circumstances that could toss the race into the House is the highlight of your election coverage, and it would be a shame to miss such a great opportunity. there is a bank holiday in germany (day of german unification). that´s why i want to write a comment at the eve of the first presidential debate. what can we expect with a governor oh sorry with a president romney? i´ve never been in this country, but it must have been wonderful before obama had been elected in office.